When I first saw this bike, I thought it was new—Honda jumping on the SR400 bandwagon and manufacturing an oldie for the home market. But it isn’t. 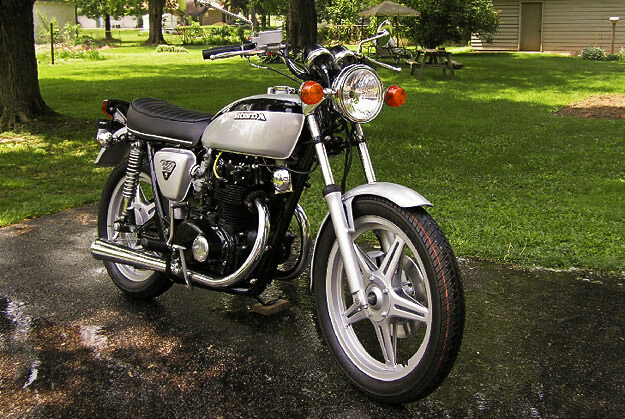 It’s an amazingly meticulous restoration by reader Bill Lane, who bought a rusted out CB for a couple of hundred bucks. “Some nice parts came my way, and I figured there were plenty of restored 450s around already,” says Bill, “so something different was called for.” To clean and de-rust the ancient components, Bill got through an awful lot of that dairy industry staple, milk stone remover. Then he powdercoated the frame and totally dissembled the drivetrain, with every part cleaned, painted or replaced. A Barnett competition clutch went in, along with a new wiring harness and Yamaha XS650 coils. The shocks are from a 1981 CB750 and the mufflers are Emgo Roadhawks. The wheels and forks are from a 1979 CB400—which bolt straight on if you can lay your hands on a CB360 stem and clamps. Bill took care of the paint himself, finishing with Duplicolor Ultra Silver and a two-part clear-coat. He’s thoughtfully posted a full write-up of the restoration online, complete with excellent pictures. If you’re looking for inspiration to get started on that wreck at the back of your garage, you’ll find it here.